Ruby Conolan Barrett in Drama on 10 December, 2015. Punk Rock shocks and wows. With its innovative staging and lighting design, and an extremely strong ensemble cast, Lion Theatre Company’s production will leave you reeling as you walk away. Reminiscent of Dead Poets Society or The History Boys, Stephen Simmons’ Punk Rock presents the minutia of things that matter so awfully much in high school, from who is sleeping with who to why your friend won’t stop burning herself with cigarette lighters. 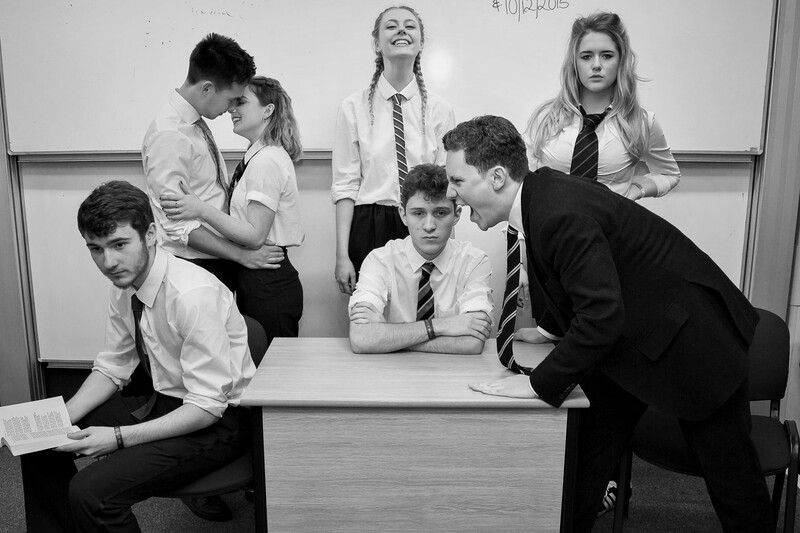 Very realistic and instantly relatable, the play represents the melting pot of your final year at high school, with all the anxiety, yearning and drama that comes with it. Punk Rock presents these issues, however, with a casual and often comedic air that makes it nuanced and incredibly enjoyable to watch. Indeed, it is this comedy and playfulness in the first half that makes the second half so shocking. Staged in Hatfield Chapel, the audience walks in greeted by loud punk rock music, a stylistic choice which instantly sets the scene and contrasts well with the assumed hallowed air of the chapel. Looking back on the piece, this was a lovely subtle touch that symbolised the contrast between what you’re meant to feel and the rules you’re meant to adhere to in this time of your life, versus how you really feel and what you really want to do. Rather than going overboard on teen angst, it was the subtle touches like this that gave the play flair. Praise must be given to both the director and every member of the cast for multi-faceted and sympathetic portrayals of their deeply flawed yet realistic characters. The actors perfectly articulated what it is like to try and cope with all the pressures of Sixth Form while at the same time trying to become an adult. Anna Galbraith was fantastic as Lily Cahill, the new girl through whose eyes we see many of the other characters. Her reactions were very well crafted and although minimalist, were perfect and engaging in the intimate venue of the chapel. By way of contrast, George Ellis played the bully Bennet Francis, a nasty, outspoken schoolboy who strutted through the space proclaiming his superiority over everyone else. This too was very well acted, and the character’s loud and over the top nature came across as a confident acting choice. Ellis’ strength as an actor could be seen in the moments when the bully’s façade was stripped, and we saw he was struggling with inner turmoil just as much as the other characters. The most contrasted and shocking performance was that of Alex Marshall, however, who played the lead character William Carlisle. While at first sweetly earnest as he asks Lily question upon question about her life, William changes over the course of the play to become slightly off-putting and then full on insane as he searches for a way to cope with the world. The later scenes were right in the audience’s faces given such a small space, and the tension was palpable as you watched everyone on the opposite pews squirming in their seats and covering their eyes. One criticism I would have of the play, however, is the way they chose to show time passing by sticking up exam dates on a board. While an innovative directorial choice, it was not actually as helpful as it should have been as the board was covered by a table for most of the audience. Programmes were also not available, which was a shame with such a talented cast. The extreme and heightened emotions of the characters in Punk Rock, contrasted with the incredible realism of the staging and acting made it a relatable and highly engaging play. If you’re into slightly sinister, very British, comedic yet dark drama about people only a few years younger than yourself acting out many of the mistakes we made in high school (with a twist), Punk Rock is an evening not to be missed.